Benefit Auction Ideas™ gives you the inside scoop on planning an auction. 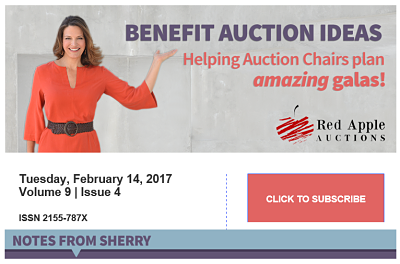 My e-newsletter is straight-up advice about charity auctions. It’s published twice a month and gives you succinct “how to” details on planning an auction event — learn about acquisitions, sponsors, silent auctions and more. Plus your subscription includes a free gift, the meaty Auction Item Guide™. It’s stuffed with procurement ideas. I have to send you a special email to say thank you for inspiring me! I have been the auction manager of a gala that was planned for 500 people. I have no previous experience in event planning and I did not even know what it means by auction. This does not mean that I am ignorant, it just means that I am innocent and I had absolutely no reason to fathom the understanding of the word or use it in my everyday vocabulary 🙂 However, having this new position “imposed” on me at my new job, I started researching. I happened to stumble upon Red Apple Auctions and that is where my research ended. I read all of your tips and tricks and worked the daylight out of them! Now I am so proud to say that our party came to an end in February (2015), and although I worked for 17 hours without a break on the day of the event, I had excitement streaming from my pores. I received a lot of great compliments, just a few being: “I have worked in this event for the past five years and this is the most organized I have ever had the auction process,” “It was a piece of cake,” etc. And of course, the one thing that made me even more excited is the amount we made from the auction. Our figures show that more people participated in the bidding process this year. I’ve been reading your e-newsletter for the last few months and enjoy your upbeat approach and original ideas. I especially loved the beach party motif photos. I’m now researching your site for information on sponsorships. With the economy being what it is, we find that our auction is both more important, but we have even fewer resources to promote it. Thank you for your information! I have been a part of our auction for 5 years now doing the silent auction baskets and have become chairman of the entire auction this year. We needed some fresh ideas and you helped a great deal. I love reading your emails, which I have been getting for a couple of years now. They always seem to spark some kind of idea. We’ve studied your Auction Item guide and tried a “Louisville version” of some of your ideas. Some worked out, some didn’t, but that’s procurement! Please let me know when the [the next Guide] is ready. I look forward to it. A live and silent auction are intrinsic to our annual Gala, and we want to do better each year. I regret you are not near us. I think you would be a welcome spark. I found your website and e-zine about a month ago and it is amazing. I have read everything on it at least twice. I don’t even have children, but for some reason I am obsessed with your website. I am up ‘til 2 or 3 AM every night reading all of the ideas and information. I just want to thank you for all the useful information. It truly has completely changed the way I think about auctions and how to properly ask for items and donations. Thank you again. I want to take a moment to thank you for all the different classes/sessions you offer. I truly appreciate and enjoy them. Your advice is great! Thank you. Thanks for all of the great information you share with us! Your site, ideas, etc have been fun to review and very helpful. Thanks! Thank you so much for all the wonderful ideas I downloaded from your website. It is a great list to jog us into action. Your enthusiastic shot in the arm came at the right time, as I need to stay pumped up so the board will be too. We have a fantastic board that works hard and we have used a lot of your ideas already over the years but it is always exciting to get new ones. I look forward to receiving your email updates and reviewing your resources online at your great website. Love your articles and all of the great information you provide. I have gotten a lot of good ideas about items to procure from your Item Guide, so we’re starting our auction development process with that. I think your website clarifies so many issues like procurement, auctioneer-no auctioneer, how much time, and all the stuff. You have so many great ideas…I can’t wait to run them by my procurement team members. I really appreciate your promptness, your support, your advice and your enthusiasm. I finally got to listen to your webinar today. It was a help. You certainly have great insight and are quite beneficial to many! And I know your classes would be very advantageous to me and the school. The info that Sherry is sharing has been very helpful to me and my efforts to grow our event. I am in awe of the advice and direction she shares. I especially appreciate how true the advice is and the success I am having following her tips. Thanks for that great article on thank you’s for auction committee members. In past years we treated our committee to a celebration dinner at a local restaurant – just a fixed price menu, volunteers picked up their own drink tab. It was nice to break bread together or in this case share rice bowls. We continued this tradition this year with a special thank you sushi/bento box lunch out for the key chairpeople. It’s a fun way to wrap up the work, talk over what we liked or would do differently, and toss out ideas about our next event. Your advice is always so helpful and your positive energy radiates through my computer screen. Thank you for your continued great advice. We are a very small Christian school and our enrollment has dropped due to the economy. I have been scouring your website for ideas and am so thankful to have found you.